Today's thali is a festive thali which we usually make it for Chitra Pournami day(full moon day comes in the month of April) for the pooja naivedhyam along with panakam,neer mor and fruits. We don't use onion,garlic and other garam masalas but my kiddo doesn't like other variety rice except some kind of pulao,so I made tomato pulao for him. Mango rice is a simple and tangy rice which can be made in a jiffy and it is a good option for lunch box. Cook the rice with enough water,cool down and separate the grains.Peel the skin of the mango and grate in a grater. Heat a pan with the oil,add the mustard seeds,urad dhal,channa dhal and asfoetida.Now add the red chilly,green chilly,peanuts,cashews and finally add the turmeric powder and curry leaves.Add the grated mango and saute it in a medium flame for 2 minutes. Now add the salt and mix it well and keep it in a medium flame for 1 minute and turn off the stove. Mix it with the rice till everything gets blend well. Serve it with fryums,papad or chips. Check out the marathoners participating in Blogging Marathon #16. Linking to Thali Mela happenings in Srivalli's space. Loved all the items in the thali. wow...super inviting Thali with my fav items...it reminds me of my Vazhaikapoo/babyshower lunch menu along with veg biryani :) Nice presentation n lovely clicks Nalini! After seeing your Thali posts i too wanted to make one of mine,but i know i can't do it rt now...will try it sometime later! Wat a spread, tongue tickling mango rice makes me hungry..Seriously cant take my eyes from ur clicks Nalini,you rock. Very beautiful spread,Delicious..would love to grab that ..N yummy tangy mango rice!! Wow the entire thali looks amazing..so wonderful Nalini..thank you.. Delicious thali.. Love all the rice dishes you have on the plate. Lovely platter !! we used to have this kind of variety rice in the terrace during childhood days for chitra pournami !! Wonderful spread.. Love all the dishes. Please Nalini...teach me how to click....lovely pictures. Look at that thaali...even though I'm not prepared rice person, if you serve the way you have ...I'll be one happy person. Super!!! Super!!! Wow.....love everything on that thali. Love the way you have served it, it's like the mini meals thali that you get in restaurants.. fabulous..Platter! !Loved everything in the Platter. thats a wonderful plate....all wonderful rice dishes and all look yummy~> Mango rice is tempting! Though I would never dream of cooking so many rice dishes at one time, I wouldn't mind tasting them. They all do look inviting. 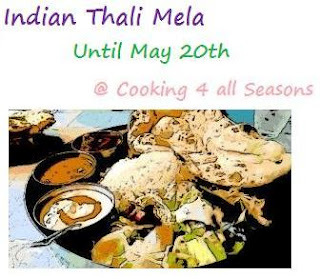 Hi nalini the thali looks very inviting.Glad to follow you do visit my space in ur free time.